There is nothing new to say and expect this coming Saturday when the Middleweight World Boxing Association champion, Gennady Golovkin, gets into the ring at the Madison Square Garden of New York. These brief phrases, describe the situation. Golovkin is considered as one of the strongest champions, and he has literally demonstrated his power to the left and to the right. He has retired his last 13 opponents in a row, all by KO. Each KO is more spectacular than the previous one, leaving no room for doubt, although, now Gabriel Rosado thinks otherwise. The truth is that with 27 fights won, 24 of them by KO, one can never think Golovkin has earned the “terminator” or the “Killer” reputation free. He has good boxing skill, power and the necessary charisma to be more than what he already is. However, Stevens is not an easy opponent. He a respectable record of 23-3 with 18 KO’s. Perhaps he has not fought very popular opponents or weight to make Stevens a real candidate to end Golovkin’s kingdom, though many experts say he could make a good fight. 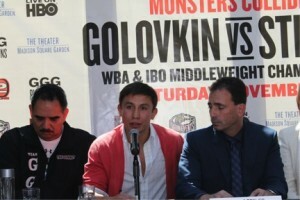 In spite of that, I am sure Golovkin has no rival in his division that could pose any real danger to his reign. As a boxing fan, I wish the story were different, that there were a good opponent that were very demanding to the Kazakh in a fight that required a rematch, and even made a good script for a movie film. In summary, Gennady Golovkin is a great with a lot of history yet tell. And that is why, once agai my favorite is GGG.